Andrea Montalbano was one of the best players to have ever worn the Harvard Women’s Soccer jersey. 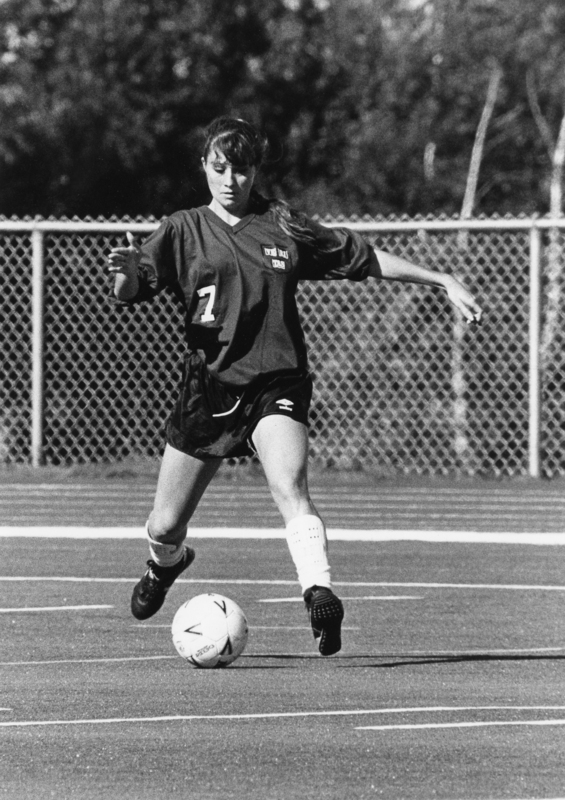 A First Team All-Ivy selection in 1986, 1987, 1988, and 1989, she was just one of 17 women’s players to ever be chosen for the distinction throughout the entire Ivy League. This honor places her in the top one percent of women to ever compete in soccer in the Ivy League. A hugely effective defensive player, Andrea helped lead Harvard to 26 shut-outs during her four-year tenure as a defensive starter. I’d first like to congratulate all my fellow inductees and express sincere thanks to the Harvard Varsity Club and selection committee. Honors like this are few in a lifetime, and I’m extremely grateful to have been elected with such an outstanding group of athletes. Thank you Tim, for the introduction, and for being there from the beginning. I still remember the fall of ’85, awaiting my second set of much-needed SAT results. You happened to be there the day they arrived, sitting politely on the living room couch trying very hard to tell me I didn’t have to open them. Needless to say, I ripped the envelope apart and we all smiled. That fall, my father and uncle brought me to Cambridge and as we sat in the parking lot waiting to unload in the Yard, I was overcome with terror. Every freshman is nervous, but I was not getting out of the car. I didn’t really have a plan, but I’d decided that Harvard had made a terrible mistake and I should just go home. My father chose embarrassment as his weapon, and began shouting the names of my assigned roommates. One of them, Lydia Smith, came over. To this day -- this evening to be more precise -- she remains one of my best friends in the world. Thanks for being here, Lyd, and thanks Dad, for getting me out of the car. Adjusting to college is a challenge for anyone. Making the Varsity squad gave me an amazing advantage. It’s a fall sport, so we started training before classes even began – suddenly I had more than twenty new best friends and advisors to tell me which gut to take, where to eat, and who was having a party. All the fears and feelings that I didn’t belong were erased with locker room banter and the slew of nicknames bestowed on me by my teammates. “Andela,” was, and is, the favorite of a few. Harvard is all about learning, right? For me, that started day one. Growing up in South Florida, I had only played offensive positions – in high school I was the goal scorer. But I did like to slide tackle – a lot – and in the very first game of my freshman season, Bob and Tim put me in as sweeper. For the non-soccer folks, that is the last defender before the goalie, and for me, it was the wrong half of the field. But, I was on the field and that’s all that mattered. In the first few minutes of play, a girl came down the line and … I tackled, and basically, crunched her, won the ball and kicked it up field. I glanced over to the sidelines and saw Bob and Tim smiling and nodding and smiling. From then on, I played defense, and learned that change was good. Like music, women’s soccer has come a long way since the ‘80’s. But not surprisingly Harvard was always ahead of the game – I’d like to thank the Athletic Department and the Friends Groups for all it did and does for its female athletes – much of which I realize now I took for granted. I was focused on playing well and winning and that’s the way it should be. I’ve spent a lot of time recently thinking about my soccer days at Harvard, and am amazed to say I have as many or more memories off the field as on. Whether it was playing card games on the bus, ordering too much food at McDonalds, or dressing up for Halloween, the fun was as great as the play. There are a lot of programs out there – but I believe what makes Harvard Athletics so special is being surrounded by great athletes who are also super smart – and very very driven. Every practice was a challenge, every road trip an adventure, and really, every Harvard interaction carried a lesson. In my career as a television news producer I often found myself in the middle of crazy news stories – with tight deadlines and pressure cooker tension. There were many times that I had to find a way to keep my cool just to function. The truth is, I learned to deal with stress, pressure, and personalities on the soccer field Being tied in overtime, taking free kicks, defending a one-on-one – were practice drills for life and work. What you don’t know, Tim, is that for many years after I graduated, I often heard your voice in the control room, encouraging me to “DIG DEEP!” In fact, a lot of Tim-isms are still a part of my life– my husband, Diron, for example is always a little worried when I yell “PUNISH THAT! !” to my daughter when she’s kicking the ball, dripping ice cream, or playing princess. Lily just turned three. It’s a wonderful honor to be back at Harvard tonight, and again I’d like to thank the Varsity Club, Bob Scalise, and in particular, Tim Wheaton. I’m grateful to all my teammates for the wins, the laughs, and yes, the nicknames. Thanks to my “eternal roommates,” Lisa and Lydia, and my friends and family for joining me. It’s hard to put into words how much soccer and Harvard have influenced my life for the better … so finally and most especially, I’d like to thank my mother Katheleen, my late father William, and my big brother Dennis, for introducing me to the, “beautiful game” and making this night possible. Congratulations to everyone. © Copyright Harvard Varsity Club, ALL RIGHTS RESERVED.